Event Purpose: To show appreciation for military personnel through a partnership with the University of Alabama Hockey Program. Description/Additional Information: Alabama Hockeyand American Legion Matthew Blount Post 555teamed up with the David Lindsay Chapter of the Daughters of the American Revolution, American Village – Veterans’ Register of Honor, Pelham Youth Hockey Association, and other youth groups to honor our military through several military-themed events as part of “Military Appreciation Night” on February 9, 2019 when the University of Alabama hosted the Missouri State hockey team at the Pelham Civic Complex and Ice Arena at 7:00 p.m. Pre-game and Opening Ceremony Events Start Around 6:45 p.m.
· Veterans, Active military personnel, and all who have honorably served received COMPLIMENTARY admission. · Pelham Fire Department displayed a large American flag at the rink’s entrance. 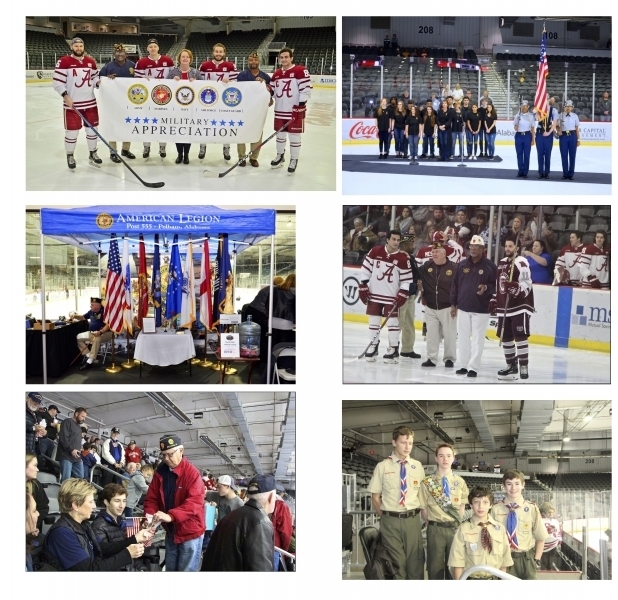 · Post 555 displayed an event tent with the flags of each military branch and a “Fallen Heroes’ Table” in the rink’s main lobby. · Eleven gift baskets were donated for giveaways for Veterans and military members. One “Soaring Eagle” chainsaw carving was donated as a fundraiser drawing.